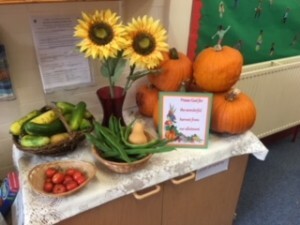 The children, staff, parents and volunteers have worked very hard on the school’s allotment this year and we have managed to gather a lovely harvest of food. These have included green beans, tomatoes, courgettes and some fantastic pumpkins! A special thank you to Geoff and Bob who volunteer at the allotment, taking classes for ‘Growing Club’ where the children learn how to plant and care for the vegetables grown.